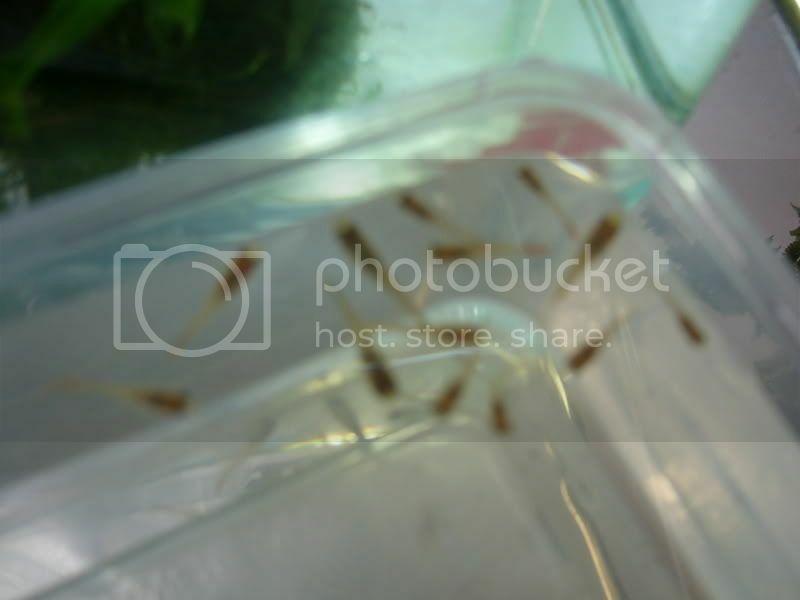 I have scoured the web simply trying to find out if guppies at the size of 1/2 inch are capable of breeding, or at what size they will become viable for breeding. It seems like a simple question and yet I can not find any age to size ratio chart to know how old they are at 1/2 inch. So I have a 15 gallon fish tank and got 4 male guppies in there. The problem is, two of them keep nipping at each other (the one actively seeks out the other, but he is the one who keeps getting nipped), one stays close to the top and ignores the others and the 4th one swims around some but also hides away in one of the corners. I figure it's just because they are all male, but I do not want to get females and have to deal with babies. So what are my options? I should add that I do not see any visible bite marks on any of their tails, the one who stays close to the top has a split in his tail, but it does not seem choppy or rough and it does not look like a bite mark. It just looks like his fin has been split in two. Would appreciate any advice. These are the two who keeps nipping each other. The blue/red one is the one who keeps searching out the yellow one. This is the one with the split tail. This is the one that swims around quite some, but stays down there for certain periods of time. My male guppies keep doing this, swimming around erratically and going up and down the side of the fish tank. Is it something normal or should i be worried? WWM has been so useful to me over the years. Once again I need your help. I am writing a paper (mock, don't worry) about the population trends of guppies and platies in the school ponds. One thing that I need is the average size of each species. All sources report the same maximum size for females, and that male guppies are usually smaller than male platies. However from my experience and observations in the ponds, platies in general are way bigger than guppies. What exactly is the average size of each species? The theory that guppies in general are smaller than platies is the core of the paper. Can you direct me to any reliable source that says that the only thing I found is on Seriously Fish, which is ok, but I would prefer something more substantial. Note that Guppies and Platies refer to those hybridized/inbred varieties usually available in shops. So, a few days ago I brought home two guppies and put them in my 5.5 gallon tank. (I know that's small, it gets better.) My friend yesterday gave me a 30 gallon tank, and I realized it was super bare because I only had 2 guppies and 3 tetras(I plan on buying more) so i bough another male guppy. (total of 3 now)I know I should have a heater with them, but I'm broke until Friday. Do you think my guppies will be okay in the cooler water until then? The water is at about 70° also, the newest guppy has one white spot on his dorsal fin, and one on his tail that I didn't notice when I bought him. Do you think that is simple color change or something worse?? I've searched your site but not found a suitable explanation so thought I would e-mail you. We've got a 60l tank fully stocked with various tetras & 2 guppies. We've had the tank over a year & the guppies were introduced about 4 months & bar a scare in the 2nd week when they showed signs of exhaustion (added more plants) they have been fine. s/he has no other signs of illness or stress & is behaving as normal. Nothing has changed in the tank apart from 3 weeks ago they went a couple of days without the tank light but I provided another light source. Have you come across this before & do you think the colour will come back? its just wait & see what happens then! Please forgive me this entirely curiosity-driven question, but I have been wondering about this for weeks and can find nothing to support or refute the idea. I've ready all the articles and FAQs I could find on WWM on the topic and could find nothing that spoke of it, and none of the papers I found in the scientific literature addressed the question. I'm actually a Zoology post-grad student and much of my interest (and my current research project) is in animal behaviour, so this is where this burning need to have questions answered comes from. Do feel free to entirely ignore what is comparatively an unimportant question if this is annoying - but I figured with all the years of experience behind the crew at WWM someone may know the answer. I have a community tank [150L] in which I have 3 male guppies. I have been procrastinating from my Uni work by compulsively reading WWM (it's MUCH more interesting than biometry) and have discovered that, contrary to my LFS advice, my angelfish will grow large enough to eat the guppies, so in hindsight this is a terrible move. I decided not to get any more guppies due to this, however two of my males are exhibiting constant aggression so I figure I may have to get some females to ease this (I am leaning towards thinking that having a less stressful life by mitigating aggression is less cruel than being eventually preyed upon, and I may get the funds to upgrade tanks and have the angels in a larger tank before that day comes). I will get to the point at some point. So, two of my males have mostly orange tails, the third has a yellow and black tail. It is the orange males who are aggressive towards one another. It appears as though these males are contesting for dominance and cannot pick a winner. They will begin by displaying to one another, neither will back down, and so they will begin to parallel swim. I am not sure if this is the correct term in marine biology (this is used all the time in waterfowl behavioural studies, which I am much more familiar with), so if not this is where they are facing towards one another with their faces next to one another and swim in a circle in the same direction (gosh, I am terrible at verbalizing visuals! - picture like a yin yang symbol). It's all mainly display and no one seems to win. On a rare occasions one male will swim away and the other will give chase, but I have not seen it advance to nipping (and there are no nip-marks to evidence that this happens when I am not looking). The male who swims away/chases always varies. The yellow guppy often tries to get involved in these displays but is ignored by the other two - he tries to partake in the parallel swims most of all, but no matter how long he tries they are not interested in his attempts. It is quite adorable to watch, but even though the guppies appear healthy I am sure the constant contests must be stressful for them to some degree. During my undergrad Zoology degree, we did an experiment on female mate choice in guppies and found the females had a significant preference for orange-tailed male guppies - it appeared to be an indicator of fitness. So this lead me to wonder if this colour preference translates to male-male competition. Is it common in aquaria to see males of a certain colour, or specifically orange males, be more aggressive? Have you ever witnesses colour-specific aggression, or in your experience is it much more random? Is it just random chance on my part that my two males have orange tails and exhibit this behaviour? <Hello Rhiannon. There's nothing stated in the literature that says Guppy colours affects aggression between males. But of course that doesn't mean it doesn't happen, and indeed, among Angelfish, the all-black varieties do have a reputation for being unusually aggressive. Since the colours were selected for by man, there's no particular reason why males or females should react to them in any specific way. But on the other hand, if we've exaggerated some of the colours that males or females respond to, then yes, you might see a heightened reaction of some sort (cf. the oystercatcher and large dummy eggs). You may want to start looking at the literature on wild-type Guppies, of which there's a fair amount. Feeder Guppies are close enough to these to be viable test subjects. From observing them, there may be some interesting extrapolations you could make, testing specific colours by choosing one-colour Guppies as your test subjects. Do also bear in mind that Guppies may not necessarily see colours the way we do (at least some fish are tetrachromatic and can detect UV) and there's also the issue that patterns rather than colours could be the trigger for certain behaviours. Thank you both for taking the time to answer my email. You've both given me a lot of food for thought and brought up points I both had and hadn't considered, no doubt I will be mulling over ideas for some time to come. Neil, thanks for the suggestion re the literature on wild guppies, shall have a read next time I have an assignment I'm trying to avoid! Interesting thoughts about angelfish: I have 3, one zebra, one marbled (mostly black in colouration) and one Pearlscale. Have seen a lot of aggression from the zebra -- it wanted to peck everything for the first week it was in my tank, but then settled in until a few days ago when it suddenly sort of 'turned on' all it's stripes as well as developing a new dark patch behind it's eye and the eye itself went very red and it started chasing my Opaline Gourami. I rearranged the tank's ornaments when doing a water change/gravel vac and it stopped being aggressive, though I think it is just starting to mature/become aggressive, may even be pairing up (no sooner than I get a hint of aggression and think the angels are turning on one another, they start schooling together instead). This one also has a bit of a belly, but I can't tell if its a fat male or a gravid female. But I'm yet to see any aggression from the black angel, despite it being easily the biggest of the three. So much personality and so much more variation in behaviour in these fish that I thought possible before getting into this hobby a few months ago. I'm learning so much every day, many thanks to you guys. Will be donating some funds come pay day as a thanks for all the hard work you guys do answering all our questions and archiving them for all to see. This is an invaluable resource. and much of my interest (and my current research project) is in animal behaviour, so this is where this burning need to have questions answered comes from. Do feel free to entirely ignore what is comparatively an unimportant question if this is annoying - but I figured with all the years of experience behind the crew at WWM someone may know the answer. and have discovered that, contrary to my LFS advice, my angelfish will grow large enough to eat the guppies, so in hindsight this is a terrible move. I decided not to get any more guppies due to this, however two of my males are exhibiting constant aggression so I figure I may have to get some females to ease this (I am leaning towards thinking that having a less stressful life by mitigating aggression is less cruel than being eventually preyed upon, and I may get the funds to upgrade tanks and have the angels in a larger tank before that day comes). so if not this is where they are facing towards one another with their faces next to one another and swim in a circle in the same direction (gosh, I am terrible at verbalizing visuals! - picture like a yin yang symbol). It's all mainly display and no one seems to win. On a rare occasions one male will swim away and the other will give chase, but I have not seen it advance to nipping (and there are no nip-marks to evidence that this happens when I am not looking). The male who swims away/chases always varies. The yellow guppy often tries to get involved in these displays but is ignored by the other two - he tries to partake in the parallel swims most of all, but no matter how long he tries they are not interested in his attempts. It is quite adorable to watch, but even though the guppies appear healthy I am sure the constant contests must be stressful for them to some degree. During my undergrad Zoology degree, we did an experiment on female mate choice in guppies and found the females had a significant preference for orange-tailed male guppies - it appeared to be an indicator of fitness. So this lead me to wonder if this colour preference translates to male-male competition. Is it common in aquaria to see males of a certain colour, or specifically orange males, be more aggressive? Have you ever witnessed colour-specific aggression, or in your experience is it much more random? 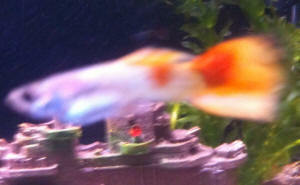 I have bred some lovely dragon tail and lyre tail guppies. The males and females are in separate tanks. Some of the male lyre tails are now maturing to adults and have become extremely aggressive towards the dragon tails to the point where several have chunks missing from their tails and one or two have died (no other signs of illness so it could possibly be from stress). I'm thinking of taking some back to the shop but wanted to check a) are lyre tail male guppies usually aggressive towards other guppy types? What's the right amount to reduce aggression? Or should I just stop keeping lyre tails? Hi Neale, many thanks for your prompt response, I'll try what you suggest, thanks again, Louise. I got 2 guppies a while back, I`ve been keeping them in a small aquarium (about a gallon and a half) without a heater or filter. <This is why we always tell people to read before they spend their money. I`ve been bought the filter and I`m saving for a heater (I already have a 10 gallon) but, being a juvenile and not old enough for a job, that money is unfortunately coming too slowly. I give the tank an extreme cleaning (just in case) and get a new guppy for the still living one. A few months later the power goes out and the bubble maker`s air stone breaks (it was old), the new air stone blows air faster than the old one causing slightly rougher water. Recently the water started smelling like mushroom juice (like when you get mushrooms from a can), so I gave it a good scrub, now about a day later the smell`s back. What could be creating that smell? They both seemed to be doing fine though until today, when I found the oldest one lying on his belly in the gravel next to the rock I have the air stone under. He didn`t respond when I tapped the aquarium (though clearly alive and doesn`t seem to have labored breathing or anything really out of the ordinary) so I reached in and nudged him, he darted off swimming normally so I went ahead and fed them, but he just went back to his spot and seemed uninterested. He`s probably around roughly a year old. Is there anything immediate I can do for him while I get the larger aquarium set up? Is there anything wrong with him or could he be resting? The guppy's fine, I think he was resting. It was late and the light had been turned out and I had just turned it back on for feeding. He`s back to his normal self and eating. I`m about to cycle the aquarium, so that at least they`re in something larger and filtered while I get the heater. I didn`t know about your site and I never knew there were fish books until a few months ago (after I bought them). I`ve checked out and read most of them now. I did study up on them though on a site or 2 (I never get an animal without studying) I`m not going to those sites again. I don`t have room for 15 gallons, I barely have space for 10 and I had to really stretch to make that space, otherwise I would. Once set up, how many guppies would be good for a 10 gallon heated, filtered, and bubbled aquarium? Would there be any fish I could put in with them? but he seems OK now so as long as I can keep him going for the next 3 or 4 weeks he`ll probably do good. Thanks, I think I might just keep some females. But I have 2 males, should I get 4 females or just get 2 for the 10 gallon? Actually I meant with the males. The local PetSmart has them separated out front, but IDk about in the back. But either way, I`d be breeding anyway. So with a male, about 3 females? Should I provide a designated area that the fry can escape to, like, a section closed off with fish netting or is it really necessary? Could it be a small area, like 1/8 of the tank or should it be bigger? I just want to know what I should do before I spend a ton of money on unnecessary stuff instead of important things. <Indian fern will live in most tanks with minimal effort. Do try to buy some, online if necessary. It works very much better than plastic plants, and also helps improve water quality. Finally got everything in the 10 gallon set up and cycled. make any improvements I also plan to ad a mountain or 2 and some fake plants possibly). 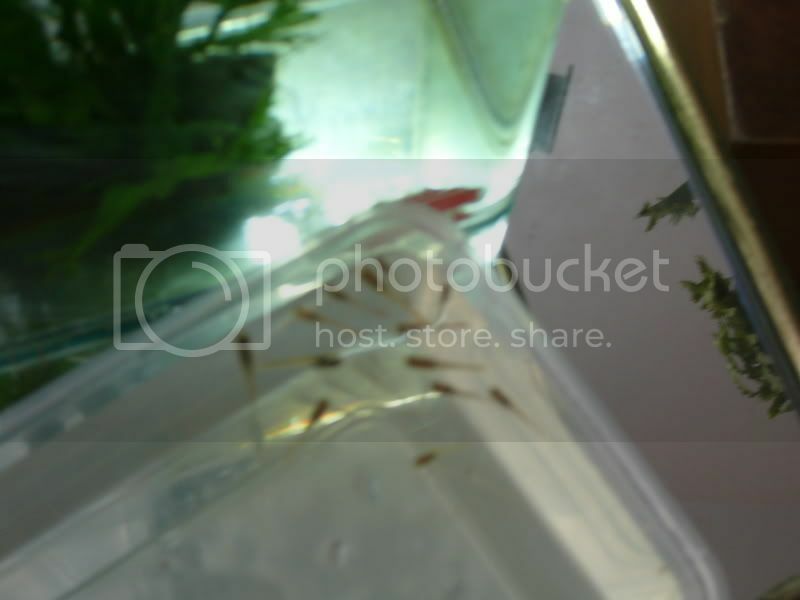 I`m planning on having 4 male guppies in the tank. I was curios though, weather it would be a good idea to also ad a Kuhli Loach and possibly some ghost shrimp? Thanks for all your help, you`ve literally been a life saver! And sorry, I've been having problems with the email/picture thing. Ok, I know this is getting a little ridiculous, but I`ve got another problem and I`ve seen several possibilities from Google search and they all part fit but then don`t fit. could something have transferred or cause him to act different? I don`t know what to make of it. 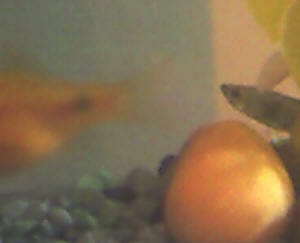 He doesn`t appear larger or thinner, his fins are in normal positions, his scales are normal. He looks like any other guppy, but vertical. If it would help I could send a video. BTW, PetSmart doesn`t have live or plastic floating plants, and I don`t trust the little local fish store all that much. Any ideas on what I could use to substitute or something easy to make? to a price, not a quality. Inbreeding is extremely common. End result, things like deformed swim bladders and crooked spines are extremely common. There aren't any cures, but you do want to prevent such fish from breeding and passing on their genes. Serious breeders will euthanise obviously poor quality fish. As pets they're fine, even quirky, and provided the fish can swim and feed normally, it won't be suffering in any meaningful sense. As for floating plants, here in England the best way to get plants such as these is by mail order. I assume that similar companies exist in Canada, the US, and Europe, so depending on where you live, try shopping online. decently, though his condition seems to be worsening, seemingly a little disoriented every great once in a while, then he`s back to swimming. Ok, I`ll try that! Thanks! <Glad to help, and it sounds like you've analyzed the situation carefully. We started our tank with 3 guppies (2 female, 1 male) and a zebra...one female had 3 babies and died within the day. About 2 months later the other female gave birth to 9 babies and we upgraded to a larger tank (now 10 gallons). and 1 male). Everything seemed fine till a couple of days ago. Our original female is acting perfectly fine, but she's turned a lighter yellow than she was and a couple of her scales seem to be standing on end. She doesn't appear to have Ick or fungus (like I've seen on my goldfish in the past), but is it normal for their scales to not all lay flat and for them to change color? Also, my oldest male (a beautiful Tequila Sunrise) today has a big chunk of his tail missing, it was not like that this morning. The 2 males (one almost adult now) do not seem to be fighting, at least I've never seen then, but I have no idea what else could cause a big chunk of his tail to be gone all of a sudden...well except the fact that his tail looks exactly like their flake food, but I doubt that's what happened. Please help, we love our fishies and they were doing so well up to this point. This fish had a completely yellow tail. The orange spots have depth and appear gritty like sand paper. The tank is 1 month old but I had the water tested and pH 7.2, no nitrates/nitrites and they said everything else looked good. The fish is fine otherwise. So far I have treated with API aquarium salt for 2 days with no change. Any suggestions would be appreciated. The tank has 7 guppies and 2 Cory cats in it. <Almost certainly Finrot. Even if the water is good now, it clearly wasn't in the past, and it does take 4-6 weeks for new aquaria to become cycled. I did research but they really don't tell u much bout their personalities and what to really expect. We have had a large community tank for several months that we've been slowly adding to. Some of the first fish we got was 6 male fancy guppies. We've not noticed any behavior problems till today. One of them seems to be content to lay on a cave like structure. <As in laying down on the roof of the cave? This isn't normal, and may imply he has problems swimming. Because of inbreeding and poor quality control, Fancy Guppies often suffer from genetic disorders including swim bladder deformities. But that would be apparent from the day he was born. The one time I saw him leave & join the others they just kept following him. Not really chasing, just following till he got sick of it and went back to the cave. One of the others followed and hung around close by for awhile. I did notice he does seem to have a "pregnant" look. Is it possible one was a female? We specifically wanted just males to prevent babies. The other fish are all acting normally and I do remember him jumping up to eat when food came floating by and also seems to occasionally pick at the surface like he's eating. I bought 3 guppies 4 days ago, I bought the male and female guppies from different stores. They are both yellow fancy guppies. (the only reason why I bought the guppies separately is that one of the stores sell the females for an extra $4 - total cost, $10 each). I've got 1 big female and one average sized female. The problem is, the male isn't interested in mating. He is not chasing the females. Is this just temporary or permanent? I know he needs to get used to the water parameters... The other thing is that my larger female often attacks the other guppies.. its like she is the dominant one. The other female also sometimes attack the male guppy. Why are they doing this? I'm happy to see that they are slowly getting along. Yesterday, I saw the male chase the bigger female a couple of times.. which is good! But he lefts the other female alone because she always chases him away. Hmmm they are currently in a 47gallon tank so I don't think that they are overcrowd..
their companions are 5 bronze cories (planning to make it 8), a couple of Otos and Siamese algae eaters. The Otos are as plump as they can be which is good and so are the Siamese. I do have 2 angelfish which I'm worried about. But they don't seem to mind the guppies. I have a 2.5 gallon tank set up to breed the guppies and I can't wait to see some guppy fry. Again, thank you for your helpful advice! Just to let you know, my big female guppies gave birth to 14 guppy fry!! I'm so excited and I totally unexpected her to give birth so early. They are currently in the 2.5 gallon tank with a steady temperature of 26C. What food should I feed them? I might buy more Otos in the future but the only downside is that they cost $14 each here in New Zealand! I can't believe it! anyways, thanks for your advice and information. She is visibly okay from what I can see. Any idea why she is doing this? My second female guppy is heavily pregnant and one of her fins on the right hand side just started sticking out. I've been keeping a close eye on her all day and so far I have not actually seen her move that fin. Can you please tell me what I can do to help both these guppies ?